DIE Martis, videlicet, 7 die Junii. 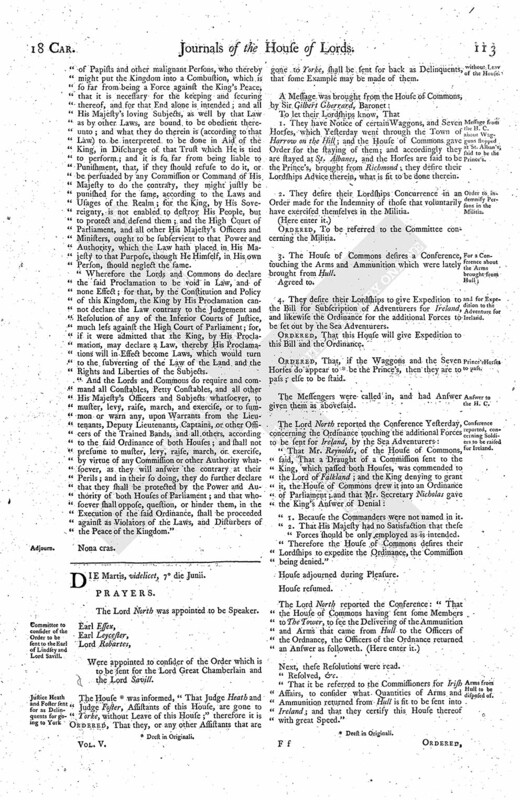 Committee to consider of the Order to be sent to the Earl of Lindsey and Lord Savill. Justice Heath and Foster sent for as Delinquents for going to York without Leave of the House. Message from the H. C. about Waggons stopped at St. Alban's, said to be the Prince's. Order to indemnify Persons in the Militia. and for Expedition to the Adventure for Ireland. Conference reported, concerning Soldiers to be raised for Ireland. Arms from Hull to be disposed of. Col. Beeling to be examined. Message to the H. C. for a Conference concerning the last Message from thence. Letter concerning the Magazine from Hull. 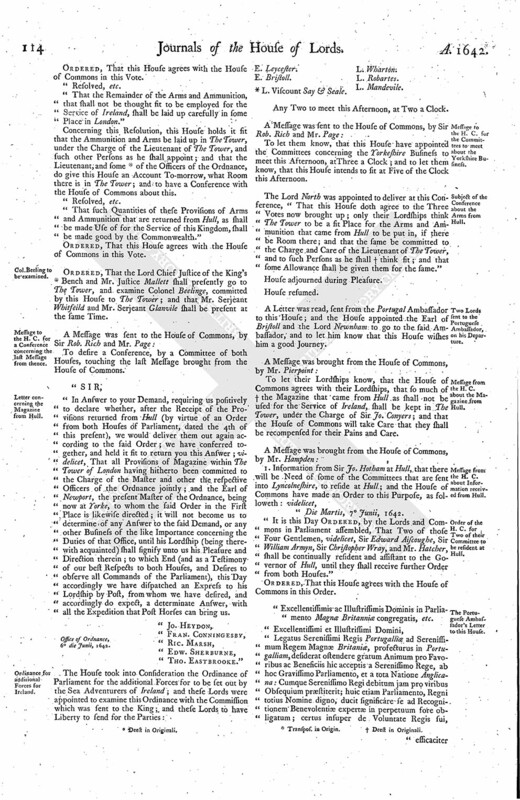 Ordinance for additional Forces for Ireland. Message to the H. C. for the Committees to meet about the Yorkshire Business. Subject of the Conference about the Arms from Hull. Two Lords sent to the Portuguese Ambassador, on his Departure. Message from the H. C. about the Magazine from Hull. Message from the H. C. about Information received from Hull. Order of the H. C. for Two of their Committee to be resident at Hull. The Portuguese Ambassador's Letter to this House. Letter from Nine Lords at York to the Speaker. Letter from Ld. Willoughby to the Speaker. Letter from the King to Ld. Willoughby. Papers from the Scots Commissioners. The King to be moved again for the Royal Assent to the Ordinance for raising Forces for Ireland, by a Sea Adventure. Ld. Willoughby's Letter concerning the Militia. The King's Letter to Ld. Willoughby, concerning it. Ld. Willoughby's Answer to the King. Request of the Scots Commissioners, about taxing them as Aliens in Northumberland. Their Propositions about the Irish Treaty. The Lord North was appointed to be Speaker. Were appointed to consider of the Order which is to be sent for the Lord Great Chamberlain and the Lord Savill. The House (fn. 1) was informed, "That Judge Heath and Judge Foster, Assistants of this House, are gone to Yorke, without Leave of this House;" therefore it is Ordered, That they, or any other Assistants that are gone to Yorke, shall be sent for back as Delinquents, that some Example may be made of them. 1. They have Notice of certain Waggons, and Seven Horses, which Yesterday went through the Town of Harrow on the Hill; and the House of Commons gave Order for the staying of them; and accordingly they are stayed at St. Albanes, and the Horses are said to be the Prince's, brought from Richmond; they desire their Lordships Advice therein, what is fit to be done therein. 2. They desire their Lordships Concurrence in an Order made for the Indemnity of those that voluntarily have exercised themselves in the Militia. Ordered, To be referred to the Committee concerning the Militia. 3. The House of Commons desires a Conference, touching the Arms and Ammunition which were lately brought from Hull. 4. They desire their Lordships to give Expedition to the Bill for Subscription of Adventurers for Ireland, and likewise the Ordinance for the additional Forces to be set out by the Sea Adventurers. Ordered, That this House will give Expedition to this Bill and the Ordinance. Ordered, That, if the Waggons and the Seven Horses do appear to (fn. 2) be the Prince's, then they are to pass; else to be staid. The Messengers were called in, and had Answer given them as abovesaid. "1. Because the Commanders were not named in it. "2. That His Majesty had no Satisfaction that these Forces should be only employed as is intended. "Therefore the House of Commons desires their Lordships to expedite the Ordinance, the Commission being denied." Next, these Resolutions were read. "That it be referred to the Commissioners for Irish Affairs, to consider what Quantities of Arms and Ammunition returned from Hull is fit to be sent into Ireland; and that they certify this House thereof with great Speed." "That the Remainder of the Arms and Ammunition, that shall not be thought fit to be employed for the Service of Ireland, shall be laid up carefully in some Place in London." Concerning this Resolution, this House holds it fit that the Ammunition and Arms be laid up in The Tower, under the Charge of the Lieutenant of The Tower, and such other Persons as he shall appoint; and that the Lieutenant, and some (fn. 3) of the Officers of the Ordnance, do give this House an Account To-morrow, what Room there is in The Tower; and to have a Conference with the House of Commons about this. "That such Quantities of these Provisions of Arms and Ammunition that are returned from Hull, as shall be made Use of for the Service of this Kingdom, shall be made good by the Commonwealth." Ordered, That the Lord Chief Justice of the King's (fn. 3) Bench and Mr. Justice Mallett shall presently go to The Tower, and examine Colonel Beelinge, committed by this House to The Tower; and that Mr. Serjeant Whitfeild and Mr. Serjeant Glanvile shall be present at the same Time. To desire a Conference, by a Committee of both Houses, touching the last Message brought from the House of Commons. "In Answer to your Demand, requiring us positively to declare whether, after the Receipt of the Provisions returned from Hull (by virtue of an Order from both Houses of Parliament, dated the 4th of this present), we would deliver them out again according to the said Order; we have conferred together, and held it fit to return you this Answer; videlicet, That all Provisions of Magazine within The Tower of London having hitherto been committed to the Charge of the Master and other the respective Officers of the Ordnance jointly; and the Earl of Newport, the present Master of the Ordnance, being now at Yorke, to whom the said Order in the First Place is likewise directed; it will not become us to determine of any Answer to the said Demand, or any other Business of the like Importance concerning the Duties of that Office, until his Lordship (being therewith acquainted) shall signify unto us his Pleasure and Direction therein; to which End (and as a Testimony of our best Respects to both Houses, and Desires to observe all Commands of the Parliament), this Day accordingly we have dispatched an Express to his Lordship by Post, from whom we have desired, and accordingly do expect, a determinate Answer, with all the Expedition that Post Horses can bring us. Office of Ordnance, 6 die Junii, 1642. (fn. 4) L. Viscount Say & Seale. L. Wharton. Any Two to meet this Afternoon, at Two a Clock. To let them know, that this House have appointed the Committees concerning the Yorkeshire Business to meet this Afternoon, at Three a Clock; and to let them know, that this House intends to fit at Five of the Clock this Afternoon. The Lord North was appointed to deliver at this Conference, "That this House doth agree to the Three Votes now brought up; only their Lordships think The Tower to be a fit Place for the Arms and Ammunition that came from Hull to be put in, if there be Room there; and that the same be committed to the Charge and Care of the Lieutenant of The Tower, and to such Persons as he shall (fn. 5) think fit; and that some Allowance shall be given them for the same." A Letter was read, sent from the Portugal Ambassador to this House; and the House appointed the Earl of Bristoll and the Lord Newnham to go to the said Ambassador, and to let him know that this House wishes him a good Journey. To let their Lordships know, that the House of Commons agrees with their Lordships, that so much of (fn. 5) the Magazine that came from Hull as shall not be used for the Service of Ireland, shall be kept in The Tower, under the Charge of Sir Jo. Conyers; and that the House of Commons will take Care that they shall be recompensed for their Pains and Care. "Die Martis, 7 Junii, 1642. "It is this Day Ordered, by the Lords and Commons in Parliament assembled, That Two of those Four Gentlemen, videlicet, Sir Edward Aiscoughe, Sir William Armyn, Sir Christopher Wray, and Mr. Hatcher, shall be continually resident and assistant to the Governor of Hull, until they shall receive further Order from both Houses." "Excellentissimis ac Illustrissimis Dominis in Parliamento Magnæ Britanniæ congregatis, etc. "Legatus Serenissimi Regis Portugalliæ ad Serenissimum Regem Magnæ Britaniæ, profecturus in Portugalliam, desiderat ostendere gratum Animum pro Favoribus ac Beneficiis hic acceptis a Serenissimo Rege, ab hoc Gravissimo Parliamento, et a tota Natione Anglicana: Cumque Serenissimo Regi debitum jam pro viribus Obsequium præstiterit; huic etiam Parliamento, Regni totius Nomine digno, ducit significare se ad Recognitionem Benevolentiæ expertæ in perpetuum fore obligatum; certus insuper de Voluntate Regis sui, efficaciter profitetur ejus Majestatem omni Effectu semper curaturam, quod Majestati Regis Magnæ Britanniæ ac Bono Publico istius Regni jucundum, conveniens, et utile erit, antiquo renascente Amore inter Anglos et Lusitanos: Hoc præsentialiter voluisset loqui; sed quia Negotia impediunt, Scriptura contentas sperat Excellentias ac Dominationes vestras, æquo Animo admissuras sinceram Voluntatem. Londini, 7 die Junii, Anno Domini 1642. Ordered, Mr. Wm. Bull and Mr. Robt. Harbyn shall be recommended to the Lieutenant of the County of Somer't, to be Deputy Lieutenants of that County. From Yorke, this 5th of June, 1642. "To the Right Honourable the Speaker of the Lords House in Parliament." Ordered, That this Letter be taken into Consideration To-morrow; and that all Lords shall have Notice to be given them to be here To-morrow. A Letter written to the Lord Wharton, as Speaker, was read, from the Lord Willoughby of Parham. The Letters are to be communicated to the House of Commons To-morrow. Ordered, That the latter Part of the Order made concerning Sir Wm. Killegrewes, That the Lord Willoughby should suppress the Riots and unlawful Assemblies, that pull down his House and Banks in the Fens; the said Clause shall be taken off from his Lordship, and he only to certify the State of the Cause. The Lord Lieutenant of Ireland reported, "That the Scotts Commissioners have delivered Two Papers to him, to be presented to their Lordships." Ordered, To communicate these Papers to the House of Commons To-morrow. Ordered, That the Lord Viscount Falkland, One of the Secretaries of State to His Majesty, shall write to Secretary Nicholas, that he will move the King to send His Answer, whether He will please to pass the Commission for the Sea Adventurers, which was sent down to Sir Ed. Nicholas; and that the Lord Falkland do, from the House of Peers, desire Sir Edward Nicholas to take Care (fn. 6) that Sir Nic. Crispe be not delayed in receiving the King's Answer, who comes prepared to give the King Satisfaction to His Two Demands, concerning the Names of the Officers, and employing the Forces only for the reducing of Ireland, and preventing Supplies coming to them. "I received a Letter from your Lordship, in which the House is pleased to do me a very great Honour, far above any Desert of mine, and little expected by me; for, my Lord, I well know my Obedience ties me to fulfil their Commands; and in that I have done, I have done but my Duty, and that which every honest Man ought to do, and oweth of Right to the Parliament; and whosoever hath that Principle in him, it will dictate to him as much, and keep him from other Bye-ways; and, for my own Part, my Heart ever was, and ever shall be, both forward and ready to obey their Lordships Commands in all Things, both with Integrity and Industry; and God's Curse light upon him and his that carries another Heart about him. My Lord, it is too mean a Way for me to express my Acknowledgement in Paper to the House for this high Favour, which I have received by your Lordship's Letter: I hope to make it appear by my Actions, that their Lordships see I am not an ungrateful Servant. It is a great Encouragement to these Parts, their Lordships Resolutions in giving their Commands to have the rest of the Militia put in present Execution; and truly, my Lord, it was out of that Regard that I did intimate it to my Lord of Essex, as holding it a Thing much conducing to the Public Good, and the only Remedy to cure these Distractions which the Kingdom is in; not out of any Regard to myself, for I know, if I suffer in executing their Lordships Commands, it must be against their Wills; and when that Day comes, I will not give a Straw for all I have, were I but a Looker-on. My Lord, as I was this Day for Lyncolne, where I appointed to begin to muster, there came a Messenger from His Majesty with this Letter, which I held it my Duty to acquaint the House with, and likewise my Answer; and am for Lyncolne, where, as in all other Places, I shall be ready to serve your Lordship, as your most humble Servant. "Ere my Letter was sealed up, I could not but give your Lordship an Account in how good a Posture I found the Trained Band of Lyncolne, which was far beyond my Expectation, considering the Unhappiness in the Sickness being dispersed in the Town, which hindered the Appearance of some; but truly, my Lord, that was fully supplied by a Company of Voluntiers, equal in Number and Goodness of Arms to the Trained Bands." Lyncolne, this 6th of June. "Right Trusty and Well-beloved, We greet you well. Whereas We understand that you have begun to assemble, train, and muster, the Trained Bands of Our County of Lyncolne, under Pretence of an Ordinance of Parliament, whereto We have not given Our Consent, which is not only contrary to Law, but to Our Command, signified by Our Proclamation sent to the High Sheriff of that Our County; wherefore, that you may not hereafter plead Ignorance of such Our Prohibition, We do, by these Our Letters, command and charge you, upon your Allegiance, to desist and forbear to raise, muster, train, exercise, or assemble together, any Part of the Trained Bands of that Our County, either by yourself or by any others employed under you, or by Warrant from you; and because you may, for what you have already done concerning the Militia of that Our County, plead that you had not so particular a Command, We shall pass by what you have already done therein, so as presently, upon your Receipt hereof, you shall desist and give over meddling any further with any Thing belonging to the Militia of that Our County: But, if you shall not presently desist and forbear meddling therewith, We are resolved to call you to a strict Account for your Disobedience therein, after so many particular and legal Commands given you upon your Allegiance to the contrary; and shall esteem and proceed against you as a Disturber of the Peace of Our Kingdom. "Given at Our Court at Yorke, the Fourth of June, 1642. "The Indorsement, "To Our Right Trusty and Well-beloved the Lord Willoughby of Parham." "The Lord Willoughby's Answer to His Majesty's Letter concerning the Militia. "As there can be nothing of greater Unhappiness to me than to receive a Command from Your Majesty, whereunto my Endeavours cannot give so ready an Obedience as my Affections; so I must confess the Difficulty at this Time not a little, how to express that Duty which I owe to Your Majesty's late Commands, and not falsify that Trust reposed in me by Your High Court of Parliament, through whose particular Directions I am now come into this County, to settle the Militia, according to the Ordinance of Parliament, which, by the Votes of my Lord Littleton and others in the House of Peers, better versed in the Laws than myself, passed as a legal Thing, and hath since been confirmed (if I mistake not) by his Example, and Your Majesty's Chief Justice Sir John Bankes, both in accepting their Ordinance, and nominating their Deputy Lieutenants: How much farther they proceeded, I know not; but, Sir, if the Opinions of those great Lawyers drew me into an Act unsuitable to Your Majesty's Liking, I hope the Want of Years will excuse my Want of Judgement. 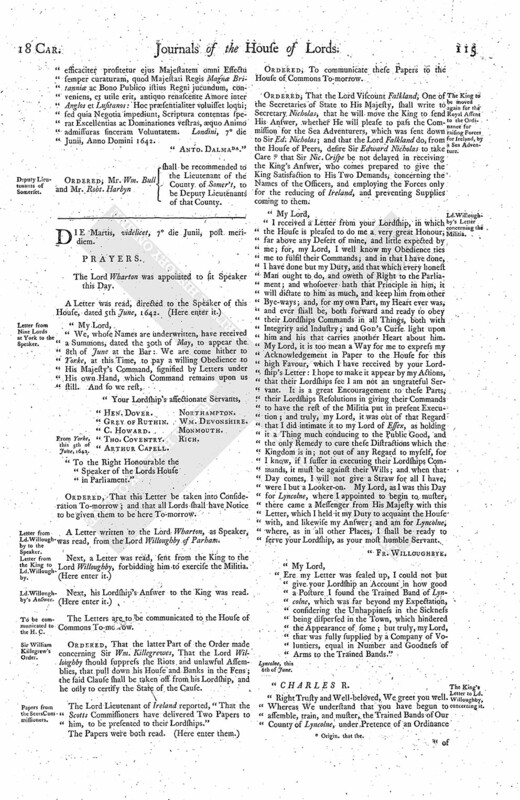 "And since, by the Command of the Parliament, I am now so far engaged in their Service as, by the sending out Warrants, to summon the County to meet me this Day at Lyncolne, and afterwards in other Places; I do most humbly beseech Your Majesty not to impose that Command on me, which must needs render me false to those that rely on me, and so make me more unhappy than any other Misery can fall upon me. 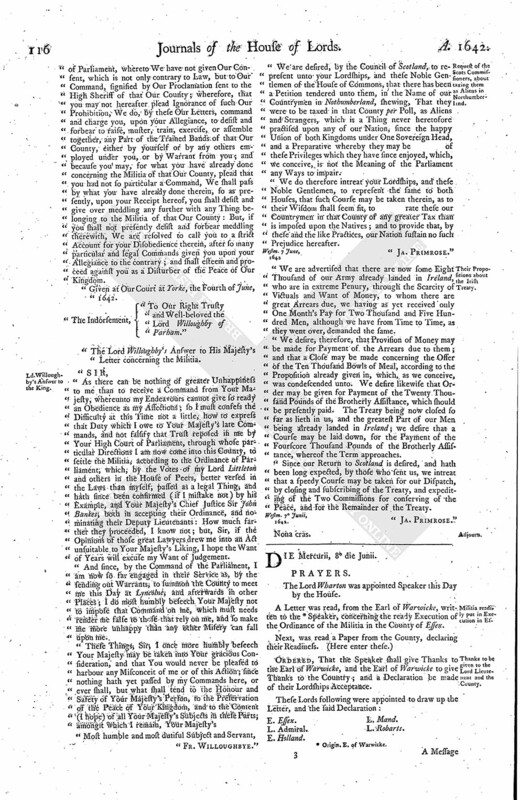 "We are desired, by the Council of Scotland, to represent unto your Lordships, and these Noble Gentlemen of the House of Commons, that there has been a Petition tendered unto them, in the Name of our Countrymen in Nothumberland, shewing, That they were to be taxed in that County per Poll, as Aliens and Strangers, which is a Thing never heretofore practised upon any of our Nation, since the happy Union of both Kingdoms under One Sovereign Head, and a Preparative whereby they may be of these Privileges which they have since enjoyed, which, we conceive, is not the Meaning of the Parliament any Ways to impair. "We do therefore intreat your Lordships, and these Noble Gentlemen, to represent the same to both Houses, that such Course may be taken therein, as to their Wisdom shall seem fit, to rate these our Countrymen in that County of any greater Tax than is imposed upon the Natives; and to provide that, by these and the like Practices, our Nation sustain no such Prejudice hereafter. "We are advertised that there are now some Eight Thousand of our Army already landed in Ireland, who are in extreme Penury, through the Scarcity of Victuals and Want of Money, to whom there are great Arrears due, we having as yet received only One Month's Pay for Two Thousand and Five Hundred Men, although we have from Time to Time, as they went over, demanded the same. "We desire, therefore, that Provision of Money may be made for Payment of the Arrears due to them; and that a Close may be made concerning the Offer of the Ten Thousand Bowls of Meal, according to the Proposition already given in, which, as we conceive, was condescended unto. We desire likewise that Order may be given for Payment of the Twenty Thousand Pounds of the Brotherly Assistance, which should be presently paid. The Treaty being now closed so far as lieth in us, and the greatest Part of our Men being already landed in Ireland; we desire that a Course may be laid down, for the Payment of the Fourscore Thousand Pounds of the Brotherly Assistance, whereof the Term approaches. "Since our Return to Scotland is desired, and hath been long expected, by those who sent us, we intreat that a speedy Course may be taken for our Dispatch, by closing and subscribing of the Treaty, and expediting of the Two Commissions for conserving of the Peace, and for the Remainder of the Treaty.